PM says European leaders agreed to goal he set forth ‘to form broad international agreement that Iran should leave Syria, all of Syria’. 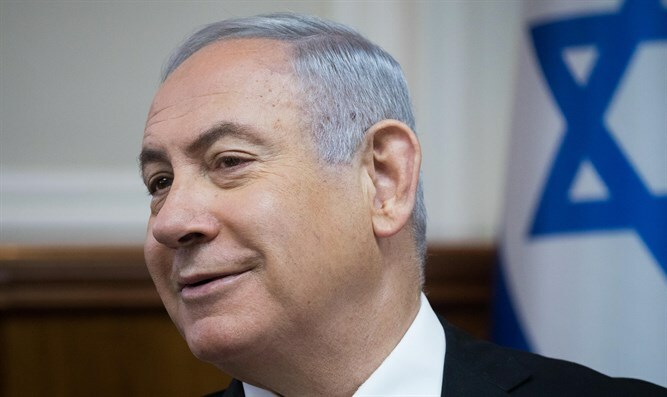 Prime Minister Binyamin Netanyahu opened the weekly cabinet meeting this morning with reference to Israeli assistance to Guatemala volcano victims and the diplomatic trip to Europe last week. “Last Wednesday I spoke with my friend, Guatemalan President Jimmy Morales, about dispatching a medical mission to Guatemala to help with the disaster. Last night I received a report about their work. They are already at work on the ground. They are showing Israel at its best and are really rendering assistance and saving lives. We are all proud of our mission and of our doctors. “Last week I visited Europe and I spoke with three main leaders there: Chancellor Angela Merkel, French President Emmanuel Macron and British Prime Minister Theresa May. “I concentrated on the Iranian aggression in our region, on the latest developments in our region and – first and foremost – on Iran’s efforts to establish a military presence in Syria. The leaders agreed with the main goal that I set, and this is formulating a broad international agreement that Iran needs to leave Syria, from all of Syria. This was the goal of the trip and it was, to a large extent, achieved. Even though Iran’s departure from Syria is a long process, I believe that if you set a goal, if you know where you are going, you have a greater chance of getting there. In any case, I made it clear that we will take strong action against attempts to establish a presence against us, and also against attacks on us. I think that this is understood and accepted by these leaders. “Today the Cabinet will approve an urgent plan to deal with the drought problem. This problem stems from climatic changes and other reasons. Over the years Israel has shown an amazing ability to deal with the water problem, which has caused endless conflicts in our region for thousands of years, also in the new era. But thanks to technology, initiatives and creativity, we have succeeded in overcoming it. “The plan that Energy Minister Yuval Steinitz will present today has several innovative features including the construction of two new desalination plants in order to increase the quantity of desalinated water in Israel. “But it also has two special, unusual elements: One, the channeling of desalinated water to the Kinneret. Usually we pump water from the Kinneret and bring to various parts of the country. Here we are bringing desalinated water to the Kinneret because as we desalinate water on the coast in the water it goes to waste because there is no use for it. Now we are turning the Kinneret into a reservoir for desalinated water. This is innovative and important, at least to the extent we are doing this, and has not been done until now. “The second thing is the rehabilitation of seven streams. This speaks to me. I used to walk in these streams, I would even cross them, more than once or even twice. Of course we all regret that there is sewage there and other things that we want to fix. Therefore this correction is important not only for the water economy but for our country’s scenic vistas. “Lastly, as the Finance Minister has commented, is the periodic dealing with the numerator. Since we passed the numerator law in the State of Israel, we have achieved budgetary control not only for the coming year but for years to come. The Finance Minister will report on our current effort.